This Royal Opera House production of Thomas Arne's 1762 masterpiece Artaxerxes is Ultimate Baroque, its magnificence designed to shock and awe. Baroque is hyperbole. It's meant to defy reality: artifice as "extreme art". In a sense, the baroque is stunningly modern because it embraces the idea that things don't have to be literal or even logical to stir the soul. First surprise: the Orchestra of the Classical Opera Company sits on stage in a brightly lit, white pit. they're wearing white too, which dazzles in the darkly shrouded Linbury Studio at the Royal Opera House. Gradually your eyes adjust, and from the shadows emerges a truly magnificent golden throne, not like any story-book European king's throne but an intricate golden web, 5 metres high. It references the golden thrones in Egyptian pyramids -Tutankhamen meets the Peacock Throne of ancient Persia. It even looks like a chrysalis, or elaborate butterfly wings. Many of the singer's costumes refer to insects, too, beetles of all kinds from Artabane's metallic thorax to the wide jackets the other singers wear which open out like wings over their trousers. The costumes (by Johan Engels) are amazing. They look vaguely 18th century yet are made of Japanese brocade and silk, lime green, neon pink, electric blue, colours that rarely exist in nature, with samurai-like shoulderpads and helmets. At once hyper-European, but with a distinctly alien, exotic flamboyance. This is the true magpie spirit of the baroque, an age when Europe discovered that worlds existed beyond anything they'd imagined. It didn't matter if the influences were Japan or Persia, as long as they were exuberant and hyper-real. The servants are mysterious, some wearing samurai helmets, but often simply swathed in black, like ninjas. This could be a reference to bunraku, the Japanese theatre tradition where puppets "act", manipulated by black-clad puppeteers, meant to be semi-invisible. It could be a comment on how formal and stylized life in Court circles might have been. When the singers collapse emotionally, they fall back, supported by the "ninjas" who become symbols of dark, inexpressible feelings. The costumes may be hyper-real and the set minimalist, but that reflects the plot. It's so convoluted it's not easy to follow even if you've read up on it. Artaxerxes's father Xerxes is asassinated by Artabanes, father of Arbaces, Artaxerxes's best friend. Both young men are in love with each other's sisters. Father frames son for the murder but son is so pure that Dad confesses the truth. Now Artaxerxes is king he can banish his regicide future father-in-law and all's well. Musically, it's surprisingly spare too, almost chamber-like, instruments simply doubled for volume. Some of the arias are familiar even though the opera is pretty much unknown. Perhaps it was a kind of "numbers opera" to showcase popular stars. Hence bravura moments where a single word can be held over 12 or more measures, so the audience can wonder at the singer's superhuman powers, even if the music isn't all that inventive. Very good singing all round. Christopher Ainslie's Artaxerxes wasn't so extreme as some countertenors can be, so he didn't shake the balanceof the ensemble but convinced as an intuitive young man who doesn't do ruthless. Caitlin Hulcup's Arbaces was so convincing that you had to remind yourself she was a mezzo. Elizabeth Watts's Mandane, and Andrew Staples's Artabanes were solid. Steven Ebel's Rimenes was striking, his stage presence mature beyond his actual age. But Rebecca Bottone's Semira was outstanding. Tiny as she is, she sings and acts with such intensity that it seems to shake her frame. It's Semira who challenges everyone, and it is she who doesn't accept that Arbaces is a killer. Left to his own devices the poor fellow is a bit of a wimp, despite being sweet. Bottone's passionate portrayal was so strong that she was worth watching even when she wasn't singing. Why she was the only person in the cast dressed like one of the puppets hanging in Marsala Zone? I don't know. Semira is a powerful general's daughter not a peasant, and she's pretty hot - Rimenes fancies her and she's going to be queen when she marries Artaxerxes. This was a new performing edition by Ian Page, who conducted and wrote additional music for the recitatives. Duncan Druce write the wonderful finale, where all the cast sing before the golden throne. The original recitatives and finale were destroyed in a fire in 1808. Having seen this, I'm now keen to hear the Classical Opera Company and Ian Page in their forthcoming series of Handel Operas at Kings Place in December. Read HERE about it. The Handel opera won't be staged, so much of the amazing impact of this Artaxerxes will be lost. On the other Handel works fine in concert performance. To read more about Arne and Artaxerxes, read Tim Ashley's article, which is the best and most informative. You can hear sound samples of the opera on the Hyperion site They've got the only full recording. I've written a lot about baroque art and its non-western influences so please follow the links at right on "baroque" and "Macau" or click HERE, HERE and HERE. These are just first thoughts, a more formal piece is here in Opera Today with production picture. Strictly speaking this song, Hexenlied, isn't about Halloween in the Anglo-Saxon sense, but it refers to Walpurgisnacht, in the German Saxon sense. On Walpurgisnacht, the night before May 1st, the Devil gathers the witches for a wild party before the coming of Spring when their powers temporarily wane. That's why the song is also called Anderes Mailied, "alternative May song". Here it's sung with great frisson by Peter Schreier, recorded around 1973. Who says Mendelssohn can't write wild and spooky? See HERE for more clips from Schreier's recording with Walter Olbertz. Even after all these years it's my top Mendelssohn song recommendation because it's so lively and animated. It was re-released earlier this year as a boxed set with discussion. There is another Schreier Mendelssohn set with Karl Engel, which is more mellow, but I like Olbertz better because it's so vivid. This is the classic, leagues ahead of anyone else. Irreverent and funny Lieder? Roderick Williams's recital at the Oxford Lieder Festival sparkled wth wit and joie de vivre. The atmosphere was electric - Williams is a much loved "local" boy. Indeed, he made his earliest public appearance at the Holywell Music Room, so it was a kind of homecoming. Many in the audience had been listening to him for years. They were rewarded by a very well chosen programme and a particularly vivacious performance. Williams in now entering his prime, his upper register secure, but it's the agility of his voice that impresses. Lovely tone is one thing, but flexible, fluid singing is a better sign of technique. Frühe und Fröhe ! Williams chose 6 selections from Mahler's Lieder aus der Jugendzeit. In Aus! Aus! a young soldier is thrilled to be marching off to war, hence the rousing refrain. Yet Mahler's mock serious setting implies more. Williams sings the refrain so you hear the stolid, unimaginative lad who prefers playing soldiers to playing with girls, and prefers drinking to thinking. Even more picaresque is Um Schlimme Kinder artig zu machen, where Williams's liveliness captures the jaunty rhythm of the prancing horse. The man sings "cuckoo! cuckoo!". It's a signal to the mother. When he sees how naughty the woman's children are, he flees. Again, there's a double meaning. It tells kids to behave or they don't get goodies from the stranger. On the other hand if they didn't act up, their mother would fool around. Williams's very mobile face lights up, singing the last "kuk kuk" with savage delight. Some composers might be tempted by the nightingales and lovers in Ich ging mit Lust to write saccharine kitsch, but Mahler sends up the cosiness factor, while writing a melody so beautiful, even the biggest kitsch fans could swoon to it. Andrew West plays the rococo piano part beautifully, so Williams can mix utter sincerity with cheerful wit. The agility of his voice paid off handsomely here. The high parts are so tricky that even Thomas Hampson strains to reach them. Williams is so flexible that they flow as smoothly as the melody. In Hans und Grete Williams leaps from darkly steady rhythms to the almost yodel-like Juchhe! Many singers have been thrown by that but Williams makes it sound easy. There are relatively few recordings of these songs. Thomas Hampson is the benchmark, his recording having the benefit of orchestrations by Luciano Berio, very sympathetic to Mahler's idiom. Matthias Goerne does a programme mixing these songs with later Wunderhorn songs, which is very good, but not preserved on tape. So Roderick Williams would be doing a duty to art if he records these songs for posterity. Hugo Wolf died tragically, but he, too, had a wicked sense of humour. Williams didn't chose the obviously funny Mörike and Goethe settings but picked selections from the Italienisches Liederbuch, where the wit is more subtle, secondary to the sheer beauty of the poems. In Schon streckt' ich aus im Bett, the poet leaps out of bed to roam the streets singing about his love. The wandering shifts in the melody reflect the gentle movements of the poet playing his lute in the night : William's voice caught the sensuality. Even more mysterious is Heut' Nacht erhob ich mich um Mitternacht, where the poet awakes to find his heart has jumped from his chest and run away. The loving way Williams sings "Du, Traute" makes it completely logical. Williams's forte has hitherto rested with English song, but he's worked on his German and now sounds very good. His Schumann Kerner-lieder were enjoyable. Baritones often slip up on the very high "girl's voice" in Stirb, Lieb' und Freud', so it's proof of Williams's maturity that he sang with smoothness and control. Less well-known were the Korngold songs from op 14 Lieder im Abschieds. Written when the composer was 23, they are a young man's attempts to write something ambitiously elaborate. He marked 198 of 200 bars with instructions for performance. They're good songs but not spontaneous or freely expressed. Korngold was a nice guy, but so dominated by his father that perhaps he couldn't allow himself the irreverent freedom of a young Mahler or Wolf. When this film of Britten 's The Turn of the Screw was screened on TV in 2004 it put a new twist on the tradition of ghost stories at Xmas. It's so atmospheric that it's not comfortable to watch, but it's full of striking insights. The music Britten writes around the children leaps about with energy. just like Miles and Flora. Quint wants them because they're "proud, curious, agile,...like a jugglers mate". So this production makes a lot of the incessant movements - wilful, even contrary by turns, so when they have to be still it feels unnatural. They're first seen in a cemetery, solemnly carrying bouquets but first chance they get they're running over the graves, irrepressible. Bly is a real stately home not a comic book palace. Children in Victorian times lived in sparsely furnished nurseries with natural light and little heating. The idea was that frugality instilled moral values. Scenes in this film are shot in cold, naturally lit rooms, contrasting simplicity with the decadent corruption Quint represents. When the Governess exclaims "How beautiful it is! ", she's not necessarily talking about the ballroom, but perhaps the grave classical elegance of the houses's structure. In this film, she's in the woods around the house, enjoying the beauty of nature. Indoor/outdoor contrasts reflect in Britten's music and themes in the narrative. In this film, the woods are a wonderful simile, because it's winter, with mists and fallen, decaying leaves. The trees are bare, their naked branches like sinister claws grasping at the sky. Significantly, Quint froze to death on an exposed path, and the ghosts appear first outside the building, gradually encroaching into the inner chambers. Perhaps that's why Miles sings the Malo song while fondling chestnuts and bird skulls in his schoolroom. In the theatre, it's hard to do ghosts because they aren't solid. In this film, there are short, elusive shots - Miss Jessel lying half submerged like Ophelia, Quint face down in mud. But even more frightening are shots where they almost "don't" appear. In one of the scenes where the women and chidlren are indoors, the camera shoots through a window in the roof. The room is neat but paint is peeling off the window frame. And you see the shadow of a head.. Who would be up there on the roof looking in? Can't be human. Later when Quint and Miss Jessel come for the kids, they aren't seen directly - a hand, the hem of a skirt brushing against the floor. It's the children you see, hypnotized. When Miles sings "I am bad" in this production, perhaps he's speaking for Quint, mocking the Governess for saving the boy. In the ENO first production, Miles kissed her, which is shocking enough but completely different. Film allows wider perspective. The scene where Miles plays the piano to distract the cooing women opens out, allowing Flora a moment to escape. She walks towards Miss Jessel in what seems at first solid ground, then revealed as the waters of the lake. Film also allows flashbacks where Miles's memories are shown. Seeing him play with his mother shows why he's so vulnerable. It also picks up on details in the text which indicate how much he does want to be saved, despite himself. Film also expands the Governess's long monologues, showing how much of the drama does exist in her mind. Telling details, such as the frame that shows her lying down, hair awry, just as Miss Jessel lay, drowned. Lisa Milne is wonderful. As she approaches Bly her voice rasps with anxiety and fear: she doesn't lose control by any means, but adds frisson. Milne's Governess is highly strung and inexperienced. Maybe that's why the mysterious Guardian picked her? The relationship between the Governess and Guardian is yet another of the shadowings that infuse this opera and make it so powerful. Milne even manages to exude a kind of eager sensuality into the part, which works well. When she sings "In my labyrinthe" she twists and grimaces with the music. In the end, she sings the Malo song so poignantly that you realize what Miles meant by the apple tree and what it means in the Bible. Mark Padmore's Quint is a smooth operator. He follows Britten's vocal quirks beautifully,, but he's more angel than demon. Gentlemanly elementals may exist but even plain Mrs Grose (Diana Montague) thinks Quint's a lowlife. This production, directed for TV by Katie Michell, allows Catrin Wyn Davies to develop Mis Jessel as a complete personality. Wyn Davies' rich, full voice makes you feel Miss Jessel was a nice person, truly "betrayed" rather than inherently evil. Caroline Wise makes Flora an independent-minded minx, stronger than Miles in some ways. What will become of her when she grows up, even away from Bly? Miles is Nicholas Kirby Johnson, nicely brooding and seductive. and see why I don't have much time for safe and bland in this opera. Ned Rorem's Evidence of Things Not Seen received its European premiere in Oxford. Rorem is a very important song composer, and this is a major cycle so it's a scoop for the Oxford Lieder Festival. Oxford Lieder spots what's good long before it reaches the mainstream. This is the way to keep your fingers on the pulse of what's happening in art song. Some of these concerts will be repeated later in London, but Oxford is where things start. It's strange that a composer as famous as Ned Rorem should be considered "unknown" in Europe. He may not be performed here as frequently as he is in the US but everyone has access to recordings. Susan Grahams's Rorem Songs was a huge hit a few years ago, winning awards all over. Carole Farley's recorded him for Naxos and there's even a British recording of his Auden and Santa Fe songs (Black Box) And these are the tip of the iceberg. The Prince Consort have recorded Rorem's On an Echoing Road for Linn. It's excellent - follow the link for extensive sound samples and hear why! Highly recommended for those who love RVW, Quilter, etc and want to hear how Rorem rejuvenates the form. The Prince Consort is another Oxford Lieder discovery. This is a lively, flexible ensemble which brings together some of the most exciting young singers around. Many are already quite high profile - some have been heard at the Royal Opera House, Glyndebourne and Salzburg. They're seriously good - grab tickets for their Wigmore Hall appearance in January 2010. Evidence of Things Not Seen is a collection of 36 songs that flow together to form a whole greater than its parts. The first group of songs are optimistic, open ended. Rorem calls them "Beginnings". "From whence cometh song?" is the very first line. The same questioning reappears throughout the cycle, expressed in Rorem's characteristic rising and falling cadences. "Middles" (the middle section) explores ideas more deeply, rather like development in symphonic form. There are some very strong songs here, such as ..I saw a mass, from John Woolman's Journal. Woolman was a Quaker, and Quaker values infuse the whole 80 minute sequence. Indeed, the the title Evidence of Things Not seen comes from William Penn. Rorem's cadences are light quiet breathing, the way Quakers think things through in silent contemplation. Two songs to poems by Stephen Crane, The Candid Man and A Learned Man, provide counterpoint. The candid man blusters, using violence to impose his will. Rorem chooses his texts carefully. Middles ends with a song to an 18th century hymn text by Thomas Ken which leads into Julien Green's He thinks upon his Death. W H Auden jostles with Robert Frost, Colette with A E Housman. Mark Doty and Paul Monette write poems referring to AIDS. Jane Kenyon's The Sick Wife poignantly describes a woman lost , still young, to some illness that keep her alive but barely sensate. In its own simple, direct way it connects to the final song, in which Penn reflects on the Bible. "For Death is no more than the Turning of us over from Time to Eternity". Whatever the Evidence of Things Not Seen may be, following the journey in a performance as good as this is a moving experienece. The Prince Consort was represented tonight by its founder, the pianist Alisdair Hogarth, and the singers Anna Leese, Jennifer Johnston, Nicholas Mulroy and Jacques Imbrailo (a former Jette Parker artist) Perhaps the sparse audience showed that people are scared off by the idea of an "unknown" modern American composer. Too bad, it's their loss. This was excellent music in excellent performance and really deserved better exposure. Public booking for the Wigmore Hall concert in January starts next week - don't miss the next chance to hear these songs again. The paradox about going to opera is that you need to erase your preconception even if you know a work well, in order to take on board what someone else might think about it. Britten's Turn of the Screw is densely packed with unanswerable questions and elusive meanings. It operates on so many levels that straightforward interpretation is perhaps least satisfying. The Turn of the Screw is about what is not visible. Are Quint and Miss Jessel ghosts? Are they projections of sexual frustration? Is it about the corruption of innocence and the nature of evil? Is Quint even the demon? Or does more evil reside in Miles than we can possibly imagine? This is an opera about what's not "real" in a tangible sense, so it's a contradiction in terms to present as straightforward. A friend of mine said of the 2007 London premiere of this production that she was "shaken but not stirred". 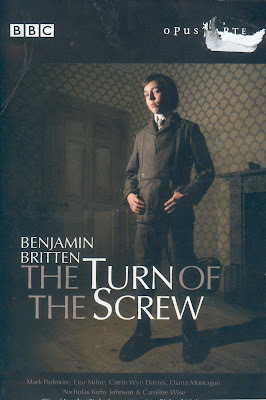 Everything about this opera shakes you but this production doesn't make much of the many deeper levels that make the Turn of the Screw one of the most disturbing and challenging pieces in all Britten's work. One of the benefits of second-night performances is that singers aren't under such pressure and often sing better. Lauded as the singers may be, they aren't necessarily the best choices for an opera like this where so much rests on what a singer does beyond producing sound. I've often wondered what the Governess might be like? Clearly she's a strong personality, tougher and more proactive than Ellen Orford. She thinks that being capable brings results. Yet the opera shows that even when she seems to beat the odds, she loses what is most important. Rebecca Evans is pretty, which is no demerit, but the Governess is a driven character. Perhaps the fanaticism of a Jane Eyre might enhance the portrayal, since the opera happens in the Governess's head as much as in objective reality, but David McVicar's production doesn't stretch Evans, or the role, to full potential. Ann Murray's Mrs Grose is a triumph, given that it's a bigger role than most realize, and she's not inthe first flush of youth. Mrs Grose isn't necessarily an older woman, but Murray brings out her maturity and common sense, if not quite the passivity in the character, whose fearfulness prevents her taking a stand. Indeed, Murray almost stole the show, so assured was her performance. Pity that the opera doesn't revolve around her. Nor does it really demand much of Miss Jessel, so Cheryl Baker doesn't need to do much. Miles, on the other hand, is absolutely crucial. Everything pivots on who he might be and what he represents. Another paradox, for it's almost impossible to imagine a young boy with enough emotional experience to fuully create the part. Is Miles as innocent as the Governess decides from the start he "must" be because he's a child? Even away from Bly, and from the influence of Quint, Miles does bad things to other children and gets kicked out of school. Maybe he's just an abused child enacting on other children, as abused children do, but it's just as likely there's something far more sinister. I used to work with someone who sang Miles when he was young. "It does things to your head," he said. "I am bad, aren't I," sings Charlie Manton, the Miles in this production, with a mix of boyish charm and calculated insolence. Manton looks young for his age, and his blond curls make him a picturebook image of angelic innocence. Definitely good casting. Manton sings with surprising maturity, carrying out the long and demanding part with ease. But notice what Britten writes into the music. The percussion tells us that Miles is beating the toy horse with ferocious venom, even when he's not riding it. Where does this malevolence come from? Seeing Manton as Miles, playing the upright piano was for me quite terrifying, reminding me of those photos of Britten himself, playing an upright piano at home as a child, his feet barely able to reach the pedals. He, too, was a curiously adult child. What did Miles mean to him on a deeper psychological level? I wonder, too, how it was for David Hemmings, who sang the first Miles while he was in a kind of relationship with Britten. To the end of his life, Hemmings staunchly defended Britten, who made no indecent advances to him. But Hemmings and several of Britten's other young companions noted that Britten was in some ways even more of a boy than they were, arrested in a pre-pubescent state. So the opera operates in deliberately ambiguity. The narrative places the blame on Quint but perhaps that's to lead you off the trail. Is Quint the demonic force that controls Miles, or it it an altogether less tangible force? It's rarely noticed why Britten has Quint played by the same singer as the narrator of the prologue. This is crucially important to meaning (particularly as both parts were written for Peter Pears). Think about it, it's scary! Michael Colvin sang Quint extremely well, with the right sardonic quiver in his delivery, which makes Bostridge's Quint a masterpiece. It's supposed to be unsettling. Colvin, despite red wig, doesn't look like Mrs Grose's description of him, but all the more credit to him for singing the part psychologically right. Again, McVicar's production doesn't bring out the potential in the role. If you weren't aware, you might think he was one of the various supernumeraries who flit about on stage doing busywork, pulling beds, screens, and other paraphernalia into position. Maybe that's supposed to evoke the idea of an over-stuffed Victorian house, filled with unnecessary labour-intensive clutter, but the setting isn't the story. True, it connects to Victorian ideas of sexual repression, but the menace in the Turn of the Screw is far more universal. Quint first appears in the tower (a phallic symbol), and Miles's pig Latin incantations hark back to ancient Satanic mysteries. Someone described this set as a little too "Hammer House of Horror", which is a good point, as it delimits the evil, packaging it in a pigeonhole. For Britten, I suspect the horror was far more personal than it was for Henry James. If anything, the evil in the Turn of the Screw comes out in things as modern as Omen and Rosemary's Baby. Or in real-life cases of madness and cruelty. In comparison, McVicar's Turn of the Screw is as safe as any TV drama. Because Charles Mackerras is almost 84, and has long been a stalwart at the ENO, it is de rigueur to praise him. Nonetheless, the Turn of the Screw is fundamentally chamber music, where 14 musicians replicate the drama in the pit. Conducting this opera isn't like conducting Wagnerian forces. It's more the art of letting the individual soloists shine. In this performance, shine they did - extremely evocative, luminous playing from each person at the right time. If only such standards held in the production. The Turn of the Screw pivots on paradox, and one of the great joys of going to the opera - any opera - is the paradox of learning how much you have yet to know, even about things you think you know extremely well. This is a wonderful opera and will always be worth hearing, but I came out of this revival wishing I hadn't known how much more it could have been. 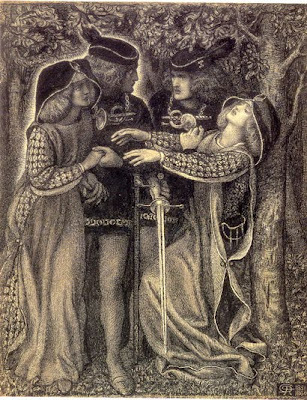 The picture is Dante Gabriel Rossetti, "When they met themslves", a good metaphor for whatever might be going on in the Turn of the Screw. What does it really mean? The words are pristinely elegant, like haiku. But like clean, pure air and the scent of early blossom, its meaning can only be intuited, not firmly grasped. What are these pictures of conifers and birches, of spruce branches sprouting the first fur-like signs of green lichen? In Grieg's setting, we can feel nostalgia, deeply felt but intangible feelings that imply that Spring, welcome as it is, means leaving the past behind. Often the song is called "Last Spring", assuming that the poet thinks he might not survive another winter. But that's not actually in the text, it's just received opinion. Possibly it comes from Grieg, who wrote the song when he was feeling old. Vinje's Norway was primitive, in the best sense of the word: things were tough and the people hardy, but death was part of life. Yet Vinje is evoking much more than standard Romantic death-obsession. He's expressing moods too complex to put into words. Grieg's setting is a wonderful, evocative commentary. So the meaning of the song is elusive and has to be felt in the soul. Which is why it's so beautiful for me. More soon - thanks to a wonderful Norwegian, the poem's been elucidated, and the song, too ! Imagine the media hysteria if some unknown work by Mozart or Schubert were found? When dodgy bits of "evidence" or composer trivia about a composer come up, the world goes agog with frenzy. But when 46 "unknown" songs by Mendelssohn are unearthed, there's hardly a ripple. Why? The discovery of these songs is quite a story. Mendelssohn was so prolific that he simply didn't get around to cataloguing and publishing all he wrote. He was a workaholic, a genius in many fields. Apart from composing, he was a virtuoso pianist and violinist, a painter, an athlete, and a formidable organizer of orchestras and cultural events. He spent his gap year in the Scottish Highlands, in those days very remote and primitive. He died aged only 38, weakened by exhaustion. The "unknown" songs were scattered among his manuscripts, which have since themselves been scattered around the world. There's a big cache of Mendelssohn papers in the Bodleian Library in Oxford, donated via his grandchildren, (of whom there were many), so that's where Eugene Asti went to follow the trail of the "missing" songs. Part of the reason Mendelssohn songs don't grab the average listener at first is that they don't word paint the way we're used to. Goethe is famously supposed to have rejected Schubert's settings of his poems. There's no direct evidence he even saw them, but it fits in with ideas prevalent in Goethe's circles which considered noble ideas and text more important than musical invention. Mendelssohn was very much in Goethe's orbit. the picture above shows him aged 9, playing for Goethe. 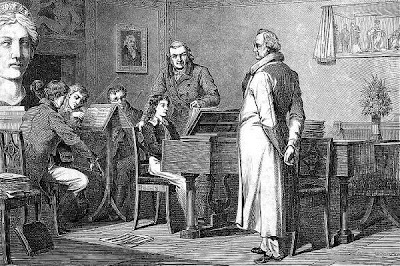 Goethe adored the young Mendelssohn, introducing him to composers he knew, like Zelter. So Mendelssohn is very much a part of that neo-classical sensibility, where people didn't do unseemly self-display. Nonetheless, Mendelssohn was far too original not to connect to the early Romantic mode. He just did it in a different, more self-effacing way. Mendelssohn songs are an important thread in song development: at times you can hear where Schumann and Brahms got their ideas from. Lots of other beautiful songs, too, like Seltsam, Muter, geht es mir (1830 to Johannes Ludwig Casper). The young girl's thrilled by the physical sensation of being in love, like the rising of sap in spring. Mendelsson expresses her excitement with breathless, rollicking lines: you can almost feel the girl's heart beat faster and faster. The punchline's hilarious, the girl doesn't know why her mother knows about such things. This, incidentally, is a song only discovered in 2007 when the manuscript came up for sale, having been uncatalogued and in private hands for 150 years. Since Eugene Asti spent so many hours burrowing away in the Bodleian, it was good to hear the songs performed at the Holywell Music Room, a few hundred metres from where the papers are preserved. Asti's work is informed by his experience as a pianist, so his new edition of the "unknown" songs for Bärenreiter are specially valuable for practical performance. I had a quick look at the book. It's very detailed, lots of notes on critical decisions made and background material which will enrich interpretation. Serious Mendelssohn singers and painists need this work. HERE is a link to the edition on Bärenreiter's site. The Oxford Lieder Festival brings treasures like this all the time, which is why it's such an important series for serious music people. Make an effort to attend as it's always interesting. This concert was almost sold out, which was good since the premiere at Kings Place in London in February happened during a blizzard and didn't get the attendance such an occasion deserved. Tonight the artists were young and relatively unknown (Aoife Miskelly, Roderick Morris, Peter Davoren, Marcus Farnsworth, Christopher Hopkins and Colin Scott) but that was no demerit: some of these songs were written for private, intimate performance, like Lied zum Geburtstage meines guten Vaters, which the 10-year-old Felix wrote for his father's birthday in 1819. His sister Fanny wrote a song too, it must have been quite some party. Mendelssohn wrote many part songs because they suit performances where people sing and play for pleasure, not to display technique. In his understated way, Mendelssohn gets to the heart of why music is so much fun for ordinary people. The final song in this concert was Volslied, a song where the whole ensemble could join together. Written in 1839, it was performed at the composer's funeral service a few years later. Different soloists sing different lines, but they unite in the full-throated final verse, Wenn Menschen auseinander gehn, so sagen sie : Auf Wiedersehen ! The last two words repeat again and again as if the composer can't bear to let them end. Yet the same notes appear throughout the song, in different guises, so if you hear the song again, it's haunted by "Auf Wiedersehen". Steht ein Pavillon aus grünem und aus weißem Porzellan. 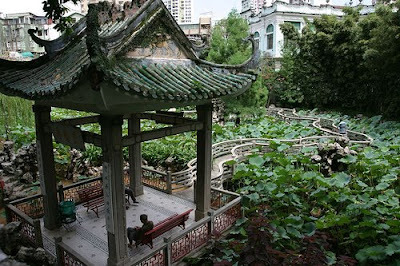 This is a pavilion in the Lou Lim Lok Gardens in Macau. It's nothing very special, just a 19th century merchant's, nothing like the fabled classical gardens in Suzhou, some of which date back a thousand years, but it's nice. Many years ago I did a big project there to illustrate Mahler's Das Lied von der Erde, getting shots at dawn, before the tourists came, timed to when the lotuses were in full bloom. And now I can't find the file! There are many pavilions in the garden, but this is the one in the middle of the lotus lake, reached by a beautiful walkway that curves and bends nine times. The idea is that you approach the pavilion not by a straight route, but one that makes you ponder the different vistas you see on the way. Gradually you shed the cares of the world til you reach the pavilion where you can be at peace. The whole concept of Chinese gardens is that you follow paths that reveal different aspects as you move around. With each turn you see things from different angles, perspectives. You're not supposed to see everything at once. Each day, different vistas. This photo, by Cody Chan, is probably May, before the lotuses come into flower. Already, though, it's hard to tell that under all that greenery, the ground is not solid, but water. Illusion again. In winter you see the water and the outlines of the lovely walkway, and "landscape rocks" in amazing shapes that look like distant mountains. (you can just spot one of them in the photo on right of walkway). But the lotus roots live on, hidden, under the soil at the bottom of the lake, waiting for spring. So already embedded is the idea Die Welt schläft ein!. Although Mahler's poem refers to "white porcelain", the glaze used in South China is almost always green, bluey-green, sometimes varied with ochre yellow, but blue green is the colour of nature and renewal. Auf des kleinen Teiches stiller, Wasserfläche zeigt sich alle, Wunderlich im Spiegelbilde. 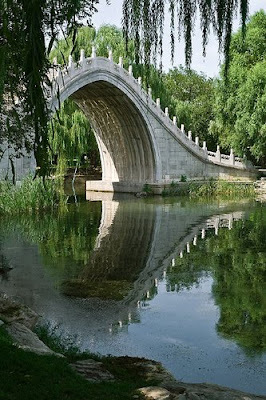 Throughout China there are bridges which arch steeply over water, so their reflections form perfect circles like the moon. The idea is a solid structure defying gravity, yet uniting air and water, reality and illusion. So "wunderlich im Spiegelbilde", amazing mirror images, "Alles auf dem Kopfe stehend" Everything stood on its head. Even as the friends sit happily in the pavilion, drinking and chatting, everything they take for granted is reversed in the reflection in the water. Nothing, however precious, remains unchanged. Wie ein Halbmond steht die Brücke, umgekehrt der Bogen. Ten years ago I went to a lot of trouble getting the photos of the garden set up at just the right angles, just the right light and timing. Now they're lost. But I couldn't be writing this now if I hadn't learned then about the metaphysics of Chinese gardens. Besides, losing all that work expresses the spirit of Das Lied von der Erde. Material possessions are ephemeral. What counts is what you carry in your soul. Please read my other posts on Das Lied von der Erde, especially the one on the literary sources and cultural icons, which is HERE. Eventually I'll try to do more, so what I've learned will help others when ich wandre in die Berge. Jacqueline du Pré passed away 22 years ago yesterday. She'd been ill so long it seemed she was immortal. But in a way, she is immortal because she was one of the first musicians to understand how film communicates and expresses things sound alone cannot capture. Because radio and records dominated music in the first half of the 20th century, the art of fully experiencing music was lost, submerged in an overlay of formality and affectation. But Jackie brought back "whole" music, radiating pleasure and joy. She touched millions of people all over the world. Her repertoire wasn't huge and her career was short. She didn't sell out or dumb down. Nowadays the makeover people would airbrush her out of existence. But these films are inspirational. I've seen people watch them who had no idea what classical music was about, and they're hooked. This video clip is the first of six that show the human side of Jackie du Pré. Watch all 6. There's a long bit on Barbirolli in part 2 and a recital in LSO St Luke's before it was renovated in part 5. In Part 6 is a concert where she plays with Daniel Barenboim conducting - how young and fresh they look! To read more please go to the Jacqueline du Pré SITE where there's lots of useful information. Benjamin Britten had few connections with the usual hotspots of British culture, but hearing him in Oxford is apt. "Oxford people don't conform", one elderly St Hilda's graduate once told me, "even when they try". A broad generalization, but with a grain of truth. Perhaps Britten might not have felt not too much out of place here. So it is was good to hear Britten's Canticles at St Hilda's, on the banks of the Cherwell, on the opening weekend of the Oxford Lieder Festival. Britten didn't follow the usual Three Choirs and academia route. Gerald Finzi may have made more extensive studies of 17th century poets, and RVW transcribed folk songs in the field, but early British music, poetry and sensibilities inform Britten's music to an extraordinary degree. In this concert, the third of three marking the opening weekend of the Oxford Lieder Festival, Julius Drake set the 2nd and 4th Canticles with Britten's arrangements of songs by Henry Purcell. I love countertenors. The voice type is ethereal, so exquisitely beautiful that it seems to come from a strange rarified atmosphere beyond this dimension, ideal for angels and unworldly spirits. In Canticle 2, "The Journey of the Magi", Britten shows how countertenors can extend the range of possibilty, the countertenor part soaring where baritone and tenor can't hope to reach. TS Eliot's text isn't sympathetic to song, with unwieldy syntax and words like "vegetation" and "dispensation", but Britten combines the voices so they extend the unison without breaking the line. The magi are marching toegether in a train, their progress as solemn as the tread of their camels. In the final verse, the steadiness gives way to a strange new consciousness: they don't really know what kind of Birth they've witnessed, and return to their kingdoms "no longer at ease". William Towers was the countertenor here. He's one of my favourites because his voice is so naturally high, completely fluid and natural. Some popular countertenors push their voices up and sound forced and artificial. Towers sounds masculine, like Andreas Scholl does, and certainly his looks help, too. With his dark, brooding good looks, and tousled riot of curls, he looks like a Byronic hero, capable of great tragedy and wildness. If he didn't sing, he could be a fantastic actor. Or Goth rock star, flashing hints of dark mystery. Luckily for us, the present generation of English countertenors are all good, but Towers has stage presence. I heard him once in a semi-staged Death in Venice as the voice of Apollo. His voice filled the auditorium even before he walked in, and suddenly he materialized, sheathed in gleaming white. Countertenors are interesting because they're not simply creatures of sweetness and light. When Towers sang Purcell's In the black, dismal dungeon of despair he evoked horror. "wracked with my fears.....with dreadful expectation of my doom". He created chilling despair by voice alone, sitting quietly on an ordinary chair, without props or gestures. Towers was very well balanced by the baritone Nigel Cliffe. He's another singer who can act. Let the dreadful engines showcased his dramatic phrasing and colour, enhanced by particularly vivid playing by Julius Drake. What fun it must be to play the dark rumbling ferocity in this song! It made the music spring to life even if much of it was written 400 years ago. After the modern sensibility of Canticle 4, with its non-commital lack of religious certainity, it was odd to return to Canticle 2, but perhaps that was Julius Drake's intention, to make us reconsider. Canticle 2 is perhaps the best known and best loved of all because it's a relatively straightforward story from the Bible. Abraham builds an altar to sacrifice his child but at the last moment God intervenes and tells him to kill a lamb instead. Traditionally, the story illustrates the idea of unquestioning obedience. and faith in the authority of God. But what if God hadn't changed his mind? And why does any God need the slaughter of an innocent lamb? Britten's text is archaically obstruse, as if to create a distance between the text and its meaning. For the meaning is more troubling than conventional religion might suggest. What does Isaac mean, in terms of Britten's innocents? Or for that matter where are Abraham's voices coming from? A boy soprano could sing Isaac, and a bass might plausibly create Abraham the elderly patriarch, but tenor and countertenor are more equivocal, because the balance of power isn't so obvious. William Tower's Isaac was intense, veering from terror to meek acceptance, while Daniel Norman's Abraham came over as a basically decent fellow, not one prone to hearing strange voices whispering "Kill!" But that's fair enough, for we know what the tenor voice signified for Britten. So what is he really saying in Canticle 2 ? More on the Oxford Lieder Festival in the next ten days. This is how song should be experienced, in small, intimate settings with an audience that seriously listens. It's worth the trip to Oxford, especially for the weekend, and the Festival has deals with hotels. The Jacqueline du Pré Building is bigger than the Holywell Music Room, but you're still up close with the performers. Two of the concerts, (Holzmair's Winterreise and Joan Rodgers's Russian Songs) are being repeated at the Wigmore Hall in November, so if you go to both you can experience for yourself how ambiences can differ. Tomorrow : Mahler Von der Jugend from Das Lied von der Erde, and its lotus imagery. 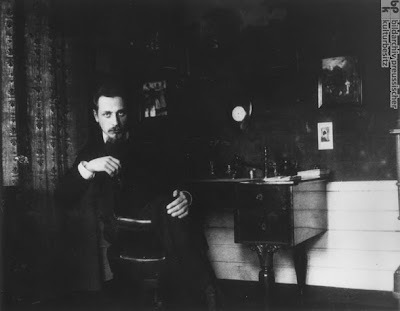 Notice how this portrait of Rainer Maria Rilke is composed. Only the poet's face and hands are clearly visible, disembodied, floating eerily in the darkness. In the room you can make out what looks like a desk, a clock, but what room is it and why is he there? Like the photo in the corner the closer you look the more the portrait opens windows. Who is this strange, forbidding man who stares glaring at the camera? Rilke is an intriguing personality, who connects to many aspects of early 20th century thought. His poems and prose writings are dense, impenetrable, best read in small doses and ruminated upon. Setting Rilke to music isn't easy. Viktor Ullmann (of whom I've written a lot) set many of Rilke's poems. Frank Martin wrote a song cycle on Rilke's Die Weise von Liebe und Tod des Cornets Christoph Rilke and there's an opera by Siegfried Malthus. which I saw in its second production in the early 90's. Rilke's been set by composers as diverse as Alma Mahler and K H Stockhausen. In November, at the Wigmore Hall, Soile Isokoski will be singing Paul Hindemith's Das Marien-leben, to Rilke's text. So naturally any composer fascinated by Rilke is going to interest me. Steven Ebel, one of the Jette Parker Young Artists at the Royal Opera House, is a serious Rilke fan and has written a piece based on Rilke's Diary of a Young Poet. Rilke embedded reference in his letters to many references to works the young poet he was advising needed to know about if he wanted to develop his art. So Ebel's piece, The Truth about Love works in three parts, pivoting Schumann's Frauenliebe und Liebe with Britten's Cabaret Songs and Ebel's setting of Rilke texts. The songs are intact, what's interesting is the way they flow back and forth, like the way ideas in Rilke's work move and develop. Read about Ebel's ambitious venture HERE. Young composers need support and encouragement, but especially those with courage and imagination. Ebel sings extremely well, and there aren't that many composers who really understand how to write for voice. Rilke was an established poet when the complete stranger wrote to him, hich is why the other man asked him for advice. Far from dismissing the young unknown, Rilke treated him with respect, giving him detailed advice over a period of several years. The letters themselves are an education. Whether the young poet became a great writer or not is immaterial: his life was enhanced by what he learned about life, art and why people write. Read the letters in English translation HERE. Getting ahead doesn't mean sneering at others and squashing competition. Rilke shows that caring is important. That's why he inspires me so much. PS Tomorrow I'll be writing about the Oxford Lieder Festival. 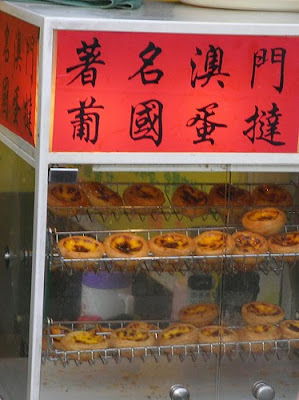 "Macau speciality: Portuguese daan tart". These are so exotic if you are used to Cantonese egg tarts, so naturally they sell like hot cakes to tourists in Macau and now are part of the city's "traditions". 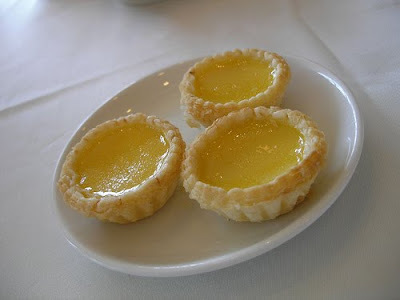 In fact until a few generations ago Macau-style egg tarts were different. These new-style tarts are exact copies of the kind sold in Portugal, the famous pasteis de nata from Belem in Lisbon, a version of which can be bought everywhere now, including Nandos in the UK. These are the Cantonese version, these ones from Maxims in City Hall, Hong Kong. You can get these in any Chinese dimsum restaurant or tea house in the world. The difference is that the western one is richer, made with whole egg and extra oil and sugar. The Chinese one is lighter, less filling. Someone just told me, the Chinese ones use more water in the custard and the pastry is rice flour not wheat, which makes sense as Chinese are often lacrose intolerant. But I suspect the Chinese one just fits better with Chinese food and taste. As for the origins? The word daan just means egg and the word tart is taken straight from the English word. But that still could mean nearly 200 years of daan tart on the China coast. There used to be a proper Macanese version, somewhat between the two types but since there aren't any Macanese pastry cooks left, they don't get made. There used to be a Macanese pastry cook in one of the Macau hotels who did them to a secret family recipe but he got divorced and his Australian wife sold the recipe to McDonald's for a fortune. As if heritage could be sold? But whatever McD's did with the recipe the ones they sell are neither one thing nor another. Please key "daan tart" in the search box on this site - lots on Cantnese food, daan tarts and even an excellent video recipe with English translation. 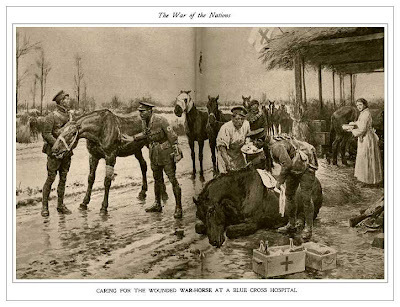 "Concerning the war I say nothing - the only thing that wrings my heart & soul is the thought of the horses - oh! my beloved animals - the men - and women can go to hell - but my horses; - I walk round & round this room cursing God for allowing dumb brutes to be tortured - let Him kill his human beings but how CAN HE? So wrote Elgar in August 1914 before the horror of the Somme and the trenches. It would have been less conscionable had he written it later. "O my horses" is the title of a book of essays on Elgar and Kipling published earlier this year. Read about it HERE on an interesting WW1 blog. Hard as such values are to swallow now, that was how people thought in those times. Don't even ask what that lot thought about non-white people. But in reality not all that much has changed; we just have different demons now. And more sophisticated methods of destruction, control and surveillance. Elgar wrote a number of songs to Kipling's poems. Perhaps his heart wasn't in them, as they aren't among his masterpieces. At the time the songs were immensely popular and Elgar toured the country conducting them, rather like a rock star tour. Next time you sit in the ENO at the London Coliseum remember that on that same stage in 1917 these songs were presented as part of a music hall programme complete with comedy songs! One of the singers was killed in battle soon after. A new CD , Elgar's Fringes of the Fleet is now available. This is based on a new performing edition. Look who's singing - Roderick Williams, Elgar baritone par excellence, and three others, including Duncan Rock, whom I've written about at the Guildhall HERE. It's released by the small independent label Somm Recordings direct HERE and from the Elgar Foundation HERE There is a sound sample on the Somm site, it's from The Sweepers, and features Roderick Williams, the other singers in chorus. Listen for the ship's bell ! Sometimes Elgar piano songs are a little precious, but he's in his element in rousing, energetic orchestral songs, if the Sweeper is anything to go by. The Somm CD is completely different to the one which comes free with the book, and Roderick Williams's singing alone is a recommendation - he's superb There is a story behind the CD too, for the performing editions were created painstakingly by Tom Higgins over a period of six years. Once I owned a photo of soldiers marching off to the trenches, past a local shop. Behind the happy, smiling faces, the shop sign said "Butchers". Not the men but those who sent them out as fodder. The German Field Marshal Helmut von Moltke wrote, "No-one hates war more than a soldier". It's not soldiers who should be condemned but the politicians who use war for their own purposes - and don't give soldiers what they need to do their jobs, and don't help them when they come back wrecked. Today, before the official opening night of the Royal Opera House double bill (Gianni Schicchi and L'heure Espagnole) there's a special matinee for schoolkids. A wonderful idea, because getting kids interested builds the audience for the future. Even though kids as young as 2 or 3 can mouth things adults tell them, in general kids have open minds, so the wonder of opera will open ears and eyes. 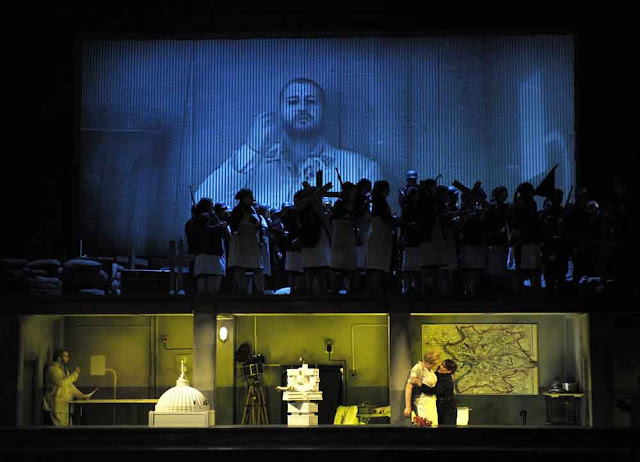 These two operas are ideal because they're fun and immediate so language is no barrier. So here's Ravel's L'heure Espagnole auf Deutsch from the 1960's though the black and white filming and style makes it look much older. But that's OK, for the plot could happen as easily in pre modern Germany. Ravel's Spain is a Spain of the mind. OCD fetishists like Torquemada exist in all places, all times, as do women like Concepcion. Indeed, it's surprisng how "modern" she is, a woman who turns the tables on her situation and uses men as objects just as her husband prefers objects to people. Hopefully this will not be lost on the kids. Drama is universal whatever the props. Mimi Coertse is South African, she's still around and well, though the film makes her look like she was born in 1832 not 1932. In fact these days she does lots of youth work, so she'd probably be delighted about the ROH youth matinee. Although I've only uploaded part one of the opera, follow the rest of it by clicking on the pictures at the end. German changes some of the syntax, but it makes the opera feel like part of a wider tradition of comic opera and operetta. 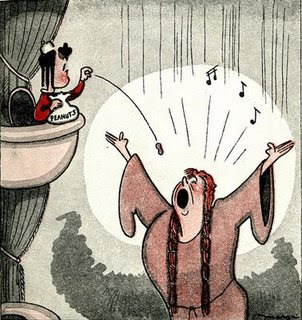 Up til around the 1920's it wasn't so uncommon to hear singers singing in whatever language they felt best, so you'd hear operas in several different languages - anathema today but accepted then. Should that tradition be reimposed ? Interesting too, how Ravel's obsessively rhythmic style picks up on the clocks and Torquemada's personality, rigidity versus release. Last night on BBC Radio 3 they broadcast Wozzeck right after the feature on L'heure Espagnole, so hearing Ravel in German makes the parallels even closer. This is the famous Qi gong (chi kung) master Tung Ying Kit (Dong ying jie) (1898-1951) in a film made in 1947. Not how "long" his style is, how long he stretches his body, almost to the point of overbalancing, yet he's in such inner control that he keeps every muscle in control without violence. Qi gong is mind and spirit first, the body flows from that. It's like channelling invisible currents, which is why the hand movements seem to push and pull. The idea is to clean your soul from negative vibes. Tai ji isn't so different really from Li Bao the poet sitting in the mountains, communing with the moon. This is real purity, untainted by the need to control, dominate or think ill of others. 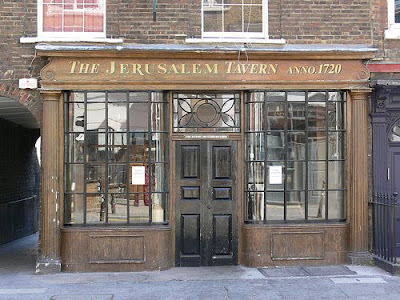 Here's the Jerusalem Tavern in London in its present building (1720), although it's been in existence since 1100. It's in Britton Street, Clerkenwell. Thomas Britton (1644-1714) gigged with Handel and many others near here. Britton, a self-educated man of great learning, built a music room on top of his house near the site of the present tavern to create a salon – the Wigmore Hall of 1678. In this salon, up a steep staircase, next to the charcoal store, Britton installed a harpsichord and 5-stop organ and hosted weekly subscription concerts. Handel was known to have played here when he arrived in London. Britton drew together everyone hip in musical and literary London. Besides Handel, many other musicians came to play – Britton himself sang and played the viola de gamba. Matthew Dubourg made his violin debut as a small boy at Britton's; he went on to conduct the premiere of Handel's Messiah in Dublin in 1742, with Handel on the harpischord. Samuel Pepys considered Britton an authority on Tudor music because he also amassed a huge collection of Tudor manuscript scores, later bought by Hans Sloane, after whom Sloane Square and Hans Crescent (near Harrods) are named. Sloane's library and artifacts became the basis of the British Museum. Jonathan Swift and Thomas Hearne knew Britton well, and described him in their work. Britton was a humble "small-coal" (charcoal) merchant and his premises were fairly basic, but even dukes and duchesses attended the "Small coal man's music club" because it provided good music and discourse. The English Civil War was still in living memory, and Victorian ideas of rigid social station hadn't solidified. Read more about the world of music clubs like Britton's, and their significance in music and social history in Arno Loeffler's excellent paper on Britton. It quotes great poems too. There are quite a lot of places like the Jerusalem Tavern tucked about in Clerkenwell, a place redolent with history if you know where to look. The Jerusalem is still run by a small brewer, St Peter's Brewery, so visiting it is an act against multinational conglomerates. Christine Schäfer sings Mahler 4/4 on Saturday at the Barbican with Haitink and the LSO. This is one I've been waiting for for months, because I like her light, clean voice, very "white" which suits the nature of the piece. In fact I like this kind of clarity in Mahler in general. On the Boulez recording of Mahler 2 she's ethereal and almost steals the show though the soprano part is fairly short. This clip comes from her perfomance of the 4th Symphony with Haitink and the Concertgebouw. I'm not sure of the exact date because they must have performed it together several times. There's a good recording from 2006. Obviously, it's not a smart idea to micro compare performances as each one differs every time, but this is a nice taster. She looks so tense in the film, in that black suit, but sounds fine. Listen to the poised way she slows down on "tausend Jungfrauen", like the way dancers dip in some graceful dance. The other day someone told me they heard someone say they didn't like Mahler 4 because it was "too light". But the child in the song is dead, and the 11000 virgins were massacred. It's not a "happy" symphony, charming as it is. Sometimes sopranos sing this with more gusto, which is fine because it is sensuous - all that food! Please see my earlier posts on Mahler 4th especially the one "Why greedy kids in Mahler 4" Schäfer doesn't look greedy but that's OK, there are many ways of singing this, and her way is good for creating the idea of a child no longer of this world. Two more reviews of last week's performance at the South Bank with Keenlyside, Dalayman, Salonen and the Philharmonia. These two dovetail, focusing on different aspects of the event. Please read HERE and HERE. Musically, though, the performance was brilliant ! For a placid soul, Bernard Haitink never ceases to surprise. After all these years, you'd think you can predict what he'll do, so you don't go and he pulls off something wonderful, And then you go and get disappointed because he's off on a limb. But that's a better thing than if he churned out the same thing all the time. Now he's getting older and frail - he avoids the steps up to the stage as much as possible - you feel you want to hear him regardless, for old times' sake if nothing else. And he still delivers. Although Haitink has conducted Mahler's symphonies countless times, his forays into Das Lied von der Erde have been less frequent. His recording with Janet Baker was so long ago, it doesn't reflect what he does now).This isn't an ordinary symphony, but a song symphony where songs act as movements. It's certainly not operatic, but the predominance of words shows that Mahler is trying to emphasize meaning. This isn't abstract sound, but has purpose. Metaphysics as music, perhaps. Although there are no "characters" in this piece the interplay between male and female voices is significant on a deeper level than vocal balance. In Das Trinklied, the symphony is fully "of this world" seeking escape. In Der Abschied, Mahler finds transcendence in images of eternal renewal. In between these poles lie the four songs which mark a passage from past to future. Der Abschied itself develops over a series of stages, until the resolution, which then floats away in that miraculous ewig... ewig...... when sound itself dissolves into the silence of infinity. So Das Lied von der Erde is more than symphony but a strange new hybrid of music and song. Perhaps the closest equivalent is Kindertotenlieder, where five songs form a transition from dark to light, from harrowing grief to deeper understanding. Pierre Boulez once said he found his way to Mahler via the songs, which is perceptive, because song in Mahler is crucial. In many ways, Das Lied von der Erde operates as three units - conductor and orchestra, and the two soloists. People often joke that there hasn't been aa perfect performance because none has managed the perfect combination, and to some extent that's true, to varying degrees, and usually it's a mixture of all factors. Often the weakest link is the tenor, because the all-important Abschied belongs to the female voice. But as I've written before, it's a kind of tradition that tenors don't understand what the drunken poet represents, and sing with too much luscious charm. Li Bao is no Mario Lanza. Even Jonas Kaufmann made a mess of the cycle at Edinburgh a few years back. Tonight's tenor, Anthony Dean Griffey, stepped in for Robert Gambill at short notice, but he's sung the part many times. If anything some slight stiffness in his voice in the first song helped dispel the soft-grained cosiness that marked Robert Dean Smith's performance with Haitink a few years back. Although there were balance problems with the orchestra at first, Griffey and Haitink judged each other more carefully fairly soon into Das Trinklied. In Von der Jugend, Griffey was more at ease because it's a wonderfully vivid song. If its true depths weren't reached, it's no discredit to him, as only a very few singers have achieved that feat. When the concert is broadcast (BBC Radio 3, 22nd October), the miking should show what was lost in the acoustic of the Barbican Hall. Only a few years ago, Christianne Stotjin made her first high-profile UK debut at the Oxford Lieder Festival, where many new singers have made a name. She's sung with Haitink many times, so she was the reason I wanted to attend this performance. In Der Einsame im Herbst, she had moments of uncharacteristic clouded diction, but in the Abschied she showed why she's one of the leading Mahler mezzos around. She saved Vladimir Jurowski's recent Mahler 2nd almost single-handed. Perhaps something was clouding the beginning of this Das Lied orchestrally too, as there were a few close calls before the first song pulled together. As usual with Haitink, orchestral soloists were showcased to advantage, through the conductor's lover of fine detail. Haitink doesn't hurry. He'll sacrifice thrust for pointillist perfection. Once I heard him conduct the first movement of Mahler's 2nd so slowly that the line began to break up, and the players could barely sustain the legato. Yet it worked, in the end. With some orchestras this isn't a good idea, but with the London Symphony Orchestra, where standards are so high, this attention works well. I've never heard the double basses quite so chillingly hollow as in the passages in the Abschied which mark the transit from one plane of existence to another. Ir takes some doing to get instruments as naturally resonant as these to sound like harbingers of death. Not a pretty sound at all, but well judged: a pity that more conductors don't realize that the beauty of this music masks traumatic fear of the unknown. Repeatedly, Haitink's left hand fluttered downwards, keeping the orchestra in check, pacing an Abschied as solemn as a procession. For procession it is, with carefully gauged stops and starts and subtle changes of emotional direction, until the music enters another place, filled with light and freedom. "Die liebe Erde" sang Stotjin, her face aglow. Clearer and brighter came the textures in the orchestra. "Allüberall und ewig". Rich, round vowel sounds evoking the richness of spring and the promise of harvests to come, and the ripening of vines as yet unknown. Das Lied von der Erde was inspired by Die chinesesches Flöte, a translation by Hans Bethge of Chinese poems. Mahler was known to have had a contact who had wax cylinder recordings of Chinese music, but whether he actually heard these or not, Asian music was not unknown in artistic circles at that time. The wonder is not that things oriental were known, but that modern opinion judges things by modern standards and underestimates the past. One newspaper writer greeted this year's "Japanese" Prom with derision! But it's clear that many European composers were drawn to exotic worlds because they opened alternative horizons, whether inspired by Japanese or other forms. (Please see HERE for the role of Japanese music on Debussy). Orientalism showed how alternative tonalities and modes could exist and flourish. No orientalism, no modern music? One interesting thing about Chinese poetry is that, like the Chinese language, it's not as dependent on strict syntax as western language is. Chinese is a tonal language, which (I think) you learn by assimilating sounds rather than learning grammar. Often no filler words like "the" or other denominators, etc. In Cantonese there are nine tones, each of which changes the meaning of a sound. "Ma" can mean "mother", "horse", even "marijuana" depending on tone and context. Chinese poetry too is meant to be read rather than spoken, so the very way the characters are set on the page is intrinsic to the concept. Think too of painting. In western art, everything is filled in. In Chinese art, blank space is part of the composition, and there are different means of showing perspective. Just as in language and poetry meaning depends on interpretation. More depends on the sensitivity of the observer. It's a very different sensibility, but artistically very fluid and creative. A great deal has been written of the poems used by Bethge and Mahler and their possible Chinese originals (please see Teng-leong Chew's commentary). There's also an adaptation of Das Lied von der Erde set in Mandarin (merely four tones) based more closely on original sources. Whole books could be written about the subject! But on a more basic level, the poems of Li Bai (Li Po) connect to a very Chinese concept, where a poet turns his back on material things, the better to contemplate the universal. Throughout Chinese literature, the artist is a lone figure, even when enjoying convivial pursuits like poetry parties. Though most lived scholarly lives, one ideal was living as a hermit, in the mountains at one with nature, abandoning the conformity and materialism of the world. 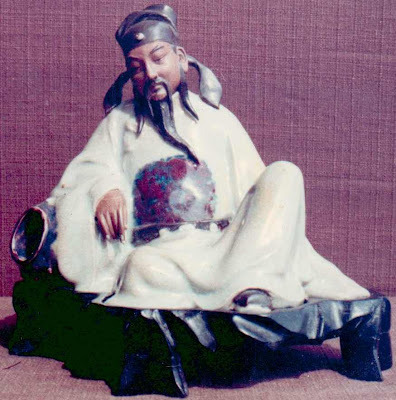 Thus Li Bai was a "drunken" poet: in vino veritas, a loosening of inhibition. He could express himself under the guise of being drunk, or moonstruck. So somehow Mahler intuited how the drunk in Das Trinklied connects to the abnegation of Der Abschied. There are a few details in Das Lied von der Erde which are culturally significant but often overlooked. In Das Trinklied, half hidden by the glowing haze of the goldnen Pokale is the image of the ape, howling at the moon over the grave. It's horrible but even more horrible to a Chinese. In Chinese culture, honouring one's forebears is almost the basis of society, and that means taking care of graves and memorial tablets. Whoever's interred in this grave really must have been fogotten, if wild apes can sit on it and wail. What's implied is the very end of civilization. Human beings write poetry, seeking wisdom. Apes howl and don't think. That's why I'm so fond of Peter Schreier's performance (recorded with Sanderling) which really captures the implicit horror of the poet's situation. There's a tradition of using laid-back opera singers in Das Lied von der Erde, dating back at least to Patzak and Wunderlich. Perhaps wine connects to luxury in the west, so fruitily lush (deliberate pun) voices are often chosen, as if this symphony were a vehicle for a Mario Lanza bacchanale. But Li Bao wasn't a bon viveur: his drunkenness isn't droll, but had a deeper purpose, understood on a completely different level in Chinese culture. Das Lied von der Erde needs, I think, the inwardness of a Lieder singer who connects to the terrifying images and implications of death and annihilation. Engaging with these depths makes the Abschied all the more transcendent. You wake from a hangover with a woozy head, but what you don't wake from is death. So stuff the Maria Lanza wannabes and pray for a tenor who knows where Mahler is coming from and where he's heading. nervous energy. This is dangerous, as the events of the last day of Tosca’s life would excite a buried Samuel Beckett heroine from torpor into frenetic activity: Tosca endures jealous frenzies, first soothed and then confirmed, a command performance before the queen, the torture of her lover, then betraying him, a brutal seduction, a hot-blooded murder, her lover’s apparent salvation, his actual death, and a desperate leap to her own." "If none of this penetrates her self-involvement, perhaps the business with Scarpia isn’t really so bad — she just gets carried away. You know: divas!" Read the whole review HERE in Opera Today. Jon Yohalem doesn't simply squawk mindlessly at the notorious production, but analyzes why it doesn't work. This is what reviewing should be. Opinion per se isn't enough, it's how opinion is arrived at. Read it whatever you think about the Met or the hoohah around it. The film is screening tonight in UK but I couldn't get in - completely sold out. On the other hand maybe I lucked out for a change. A secret kept for 50 years?